I never stole much in my life. But one day i will have to account for stealing a handful of tapes from answering machines that I saw on flea markets. I paid for the tapes, but I did not say that I took them out of the answering machines. In the old answering machines were two different tapes: one for the incoming messages and one for the outgoing message. The tape for the outgoing messages is a loop, usually of 30 seconds length, but I have a few that are of one minute length. I can’t remember having stolen one of such outgoing message cassettes. There is rarely anything interesting on these tapes. I have a few of them; they show up on flea markets without the answering machine too. The incoming messages tapes are far more interesting. They are ordinary cassette tapes, although sometimes you got a tape with the machine that had a label with the text “incoming messages cassette”. 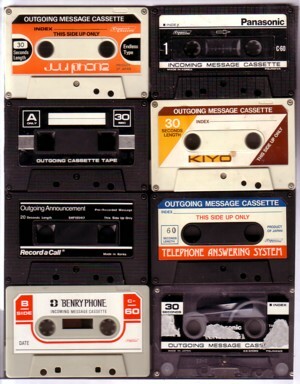 I wish everybody had used such tapes in their answering machine. That would made it much easier for me to find them. Most of the cassettes with incoming messages in my collection are regular tapes, and I only discovered that they were used in an answering machine by listening to them. Never throw a cassette away before listening! Because almost all incoming messages cassettes that I have are in Dutch (and because I am working on a montage that I will share with you later in this Soundtrack) I just made a little collage tonight with some random outgoing messages. If you happen to have some too, please send me an mp3, so that I can add them to the collage.